Something unexpected happened last night. I bought yarn. Now most of you won’t believe me when I say I had no intention to buy three skeins of wollmeise in ‘heavy metal’. But really it’s true. I plan to make a very wearable work cardigan from it, more than likely it will be by Veera, and most probably it will be Slow Line . Hence, I have to get ‘Folded’ knit, before it arrives, I estimate a week and a half… Then the guilt of buying more wm will have subsided. The stars were aligned last night, it was meant to be, and I let it happen. I didn’t know when the update was on, I just happen to be in the right place at the right time. I wasn’t even logged in when the screen went grey. I had forgotten my password (it’s been that long), finally after 3 goes I was in. I made it to checkout… After all that! This yarn was meant to be mine. Here’s a peek at Folded’s progress, finally I think I’m excited about knitting it again. And your plans sound gorgeous; I’m really feeling the love for grey at the moment so I’m really looking forward to seeing the end result! 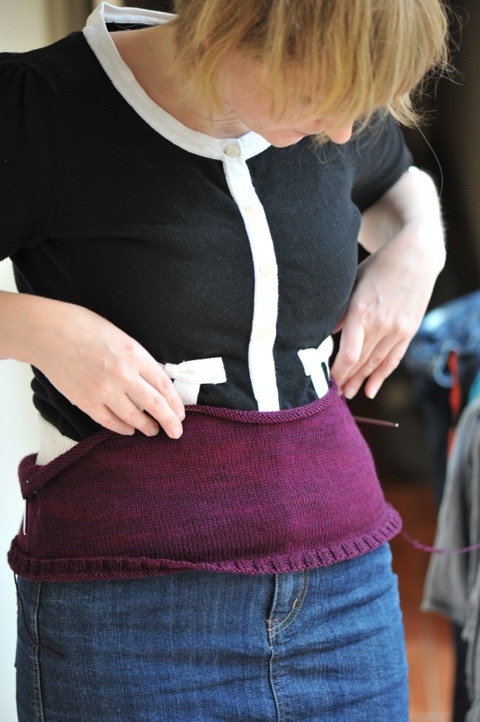 Folded is looking gorgeous, such fine knitting and lovely rich colours. might have been nice to spend those dollars on a new Mamiya 7 body! I’m with Anna, no guilt, especially when you make such beautiful things from the yarn. Love your Folded.